Welcome to The Portable Basketball Hoop Store owned by Competitive Edge Products, Inc. Here you will find all kinds of information, advice, videos and assembly instructions for basketball systems manufactured by Spalding and Lifetime. Here you will find information on the best basketball goals made by these manufacturers. Basketball is one of the most popular and competitive sports in the world and the competition to get to the top is fierce. It is important to have a system that you can practice with at home when you don't have access to the gym or a partner to practice with. It is also a fantastic sport to utilize multiple muscles in your body, prevent atrophy (Pete Egoscue - author of Pain Free), build your conditioning and endurance and helps you lose weight and stay in shape. 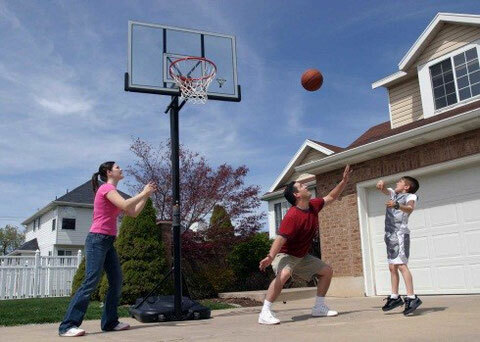 Why Choose a Portable Basketball Goal? Assembly is easier and faster than an inground basketball system that requires cement. Neighborhood covenants are often more accepting of portable basketball goals . When the time comes to replace the goal there is no heavy digging or concrete extraction to remove the system. Are designed for the homeowner to assemble - avoiding contractor assembly and installation fees. Easily transported if the customer moves or sells the item. Portable goals have come a long way with the adjustment mechanisms allowing for all ages to join in the fun. Why combine Spalding and Lifetime Basketball Systems on the same site? Spalding and Lifetime Products have many features the frequently build on one another. For instance, Lifetime Products has many portable basketball hoops that reach the very low end of the spectrum, while Spalding has several basketball systems that reach the very high end of the spectrum. In the middle range, you will see a variety of models that are comparable in design and features that will allow you to choose the very best goal for you. You may find a some other brands on the site as well, however there are fewer other brand options to choose from. Where do you ship your portable basketball hoops from? All of our systems are shipped brand new from the manufacturer's warehouses. Lifetime systems ship from Utah and Spalding systems ship from Alabama. Orders for our portable systems generally arrive within 10 days of ordering the product. Tracking numbers are provided to your email address as soon as they are available to help you stay updated on the status of your order. Some of the products on this site are available to be fulfilled via Amazon from multiple warehouses around the country. Some of those products offer expedited shipping options for faster delivery. Portable basketball hoops from Lifetime Products are designed with a roller base system which enables you to situate your basketball target anywhere. Their mobile basketball hoops rely on a heavy-duty polyethylene roller base filled of sand or water for stability. No concrete install required! As you navigate through our site you will find Lifetime and Spalding portable basketball goal videos and links to reviews on most of our products. Many of the products also have a link to a directory of installers for help to get your hoop up. We also show some replacement backboards and basketball accessories to improve your skills. If you're looking for a Lifetime or Spalding basketball base replacement check through our site for complete new units or you may want to try Amazon. You can reach Spalding or Lifetime Basketball Systems customer service departments at: 1-800-558-5234 or 1-800-242-3865 respectively. For our low-price guarantee options on our Lifetime items visit our Competitive Edge Products Inc. website and find a wide selection of competitively priced portable basketball hoop products.